The brothers from Greek origin but born and raised in Belgium, spent the last years travelling across Europe and playing in some of the best venues around. Their debut release on the legendary Bonzai Records, “La Cocaina/Eivissa 2007” was a techno banger that did really well on the White Isle, being played by many djs all around. They were asked as main act on Prestige Ibiza’s “Glamour Night” and as residents of the new club, playing on events like the Manumission Carry-On. 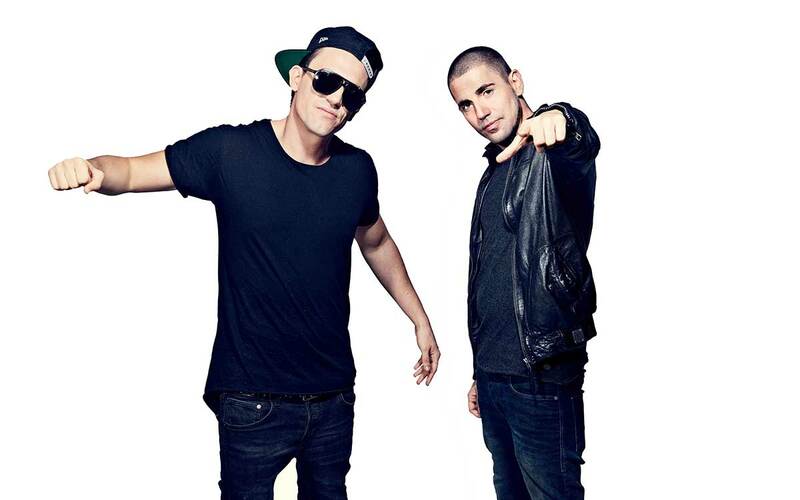 This year, Dimitri Vegas & Like Mike are the new pick of Joia Records, the Swedish top-label established in Stockholm about 5 years ago. In this short period of time they have been able to attract some of today’s biggest producers and have releases of djs like Eric Prydz, Axwell, Steve Angello & Sebastian Ingrosso, John Dahlback, Ian Carey, Steve Lawler just to name a few. Since “Push it!” takes a completely different direction as Dimitri Vegas & Like Mike’s first release, the brothers decided to go for a new alias to join the label of the Swedish House Mafia: NoiseFreak! The release contains an electro-styled bigroom mix by Dimitri and a more underground minimal-touch by Mike. The release was presented on its official releaseparty in Belgium’s newest and biggest venue : Noxx Antwerp. NoiseFreak is not their only project that is about to hit the stores : MadFunk is their electro take of the eighties classic “Love Can’t Turn around” by Jackmaster Funk. The promo has been getting fabulous responses for months and the track promises to be one of the summer anthems of 2008. The minimal/tech-house lovers are not left behind either, Dimitri Vegas & Like Mike’s TerraPlastik project was released with its first ep “Morning After” on the New York based Bodywork! A sub label of Peak Hour Music. The main track ‘Dubai Nights’ hit the Beatport minimal charts on place 53 after only a few days. With these projects, releases and various upcoming remixes you can be sure to find the brothers and their projects in many clubs, events, stores and record cases in 2008. As a team, they played a clubs like La Rocca (BE), Versuz (BE), Creamm (BE), Misturafina (IT), Koala (IT) and may more. They don’t just bring a DJ-set, but a unique live performance. By combining Dimitri’s beats with Mike’s voice, they found a unique style playing together, entertaining the crowd with cd’s, decks, fx and of course, the mic! Their live sets range from “hands in the air” peak time, dance floor-destructing electro beats, to a deeper minimal sound and uplifting techy vibes. The brothers are also known for an energetic and fun performance. We try to make our set a great clubbing experience for everyone, we bring a cocktail of electro and tech-house on the rocks, with a touch of techno and minimal… shaken not stirred. We defenitely don’t like to be branded with a style, the direction we take our set all depends on the crowd, but we only play music that gets under our skin… and that has always worked so far!